The tide recently brought in an intriguing invitation, which had travelled across the globe, from Manila to Boston to San Francisco to London. The executive director of CANVAS, a sophisticated arts/environment non-profit organization, liked my first book, In a Japanese Garden, a meditation on Nature. He invited me to write an environmental children’s book for a Filipino artist to illustrate, and I was honoured to accept. The beautiful beaches I have been blessed to enjoy, on the Arabian Sea and on the Indian, Pacific and Atlantic Oceans, compelled me to choose marine pollution as the environmental focus of the book, Message in the Sand. 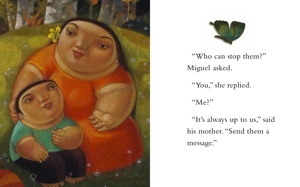 An art book for children, it introduces the young eco-champion, Miguel, a new kind of hero for a multi-ethnic world. 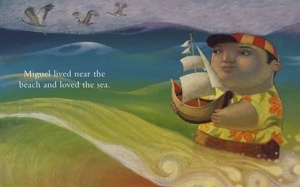 Miguel loves the sea and sets out to save it. He is armed only with faith, imagination and his mother’s love and encouragement; his only weapons are those that the sea has provided for its own preservation – seashells, seaweed and sand. With these simple tools, Miguel must battle two giants: the powerful mining company, whose toxic waste is ruining the beach and killing the beautiful fish and seabirds; and the powerful ocean that keeps washing away his words. The book teaches gentle lessons in perseverance, and in finding unusual and peaceful means to effect change. It inspires and empowers children to act against seemingly insurmountable odds, showing us how even one child can make a difference. Message in the Sand showcases the magnificent sandy beaches, fascinating fish and exotic coral reefs and seabirds of the Philippines, its exquisite paintings transporting us to the beach, by detailing the iridescence and shapes of shells, the shades and powerful surge of the waves, the lush tropical plants and the texture of the sand. 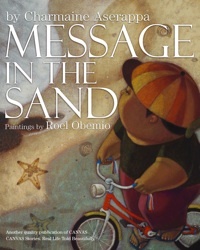 Gigo Alampay of CANVAS assigned the rising young artist Roel Obemio to illustrate Message in the Sand, and it has been thrilling to see Roel tenderly and amusingly render my story in brilliantly colourful, large-scale acrylic-on-canvas paintings, portraying the characters as unforgettable and endearing. His signature naïf style is inspired by the bountiful art of Fernando Botero of Colombia. I grew up with great respect and admiration for the divine creation, and the need to conserve it. My father photographed wildlife in Asia and Africa, my uncle was the Conservator of Forests for Sri Lanka, and I delighted in Nature from an early age. Message in the Sand makes us aware of how we all share this wonderful but fragile planet, and how children must be taught that caring for it is the sacred duty of every human being. Miguel, named for the Archangel, also fights a spiritual battle. These days, many books exploit and endanger children by exposing them to witchcraft, the occult, sorcery, magic, horror, and the depressing side of life. Miguel bucks this unsavoury trend, offering parents an alternative hero for their young children. Active and positive, he lives in the real, not the fantasy world, he is challenged to overcome its real evils; he places his hope in prayer, not in spells… and he has the victory. The book, and a complete range of attractive giftware featuring the paintings from Message in the Sand are available on www.canvasdownstream.com. All proceeds will benefit CANVAS promotions of Philippine art, culture and the environment. True to its international origins, Message in the Sand will be given a dual launch: the prestigious Ayala Museum in Manila will launch Message in the Sand in the East on November 27th 2008, with a major exhibition of the paintings from the book; and the Embassy of the Philippines in London will launch it in the West. May it sail on, to spread its message all over the world, to the greater glory of God. Charmaine Aserappa volunteers as Communications Officer of an Anglican church in London named in honour of St. Francis of Assisi, patron saint of the environment. She worked for the finest book publishing houses in Toronto, New York and London and now promotes human rights. Her first book, In a Japanese Garden, (with woodcuts by Akiko Naomura; Council Oak Books, San Francisco, USA 1999) is a Publisher’s Weekly Top Ten Gift Book, an Amazon.com Five Star, ‘Most Wished For Book’ in Christian Poetry and ‘Most Gifted Book’. In a Japanese Garden appears on Bestseller Lists all over the world in categories as diverse as philosophy, architecture, the environment and poetry, and is used in many schools. Ms. Aserappa is the daughter of an English mother and a Sri Lankan father, and has lived in Asia, North America and Europe. Her son, Nicolas, is an artist, photographer and writer.